Mrs B's Teeny Schnauzers The following questions are being asked of you so that the right puppy and the right placement of each puppy is made by bringing the various requirements of both the puppy and his or new owner(s) into perspective, BEFORE a choice is made. I hope you will agree that the animal's welfare must be my foremost consideration in considering a placement. Please answer the following questions as completely as you can, and return this form when you've finished. I look forward to talking with you. If you feel you are uncomfortable with this form or providing basic information, please contact another breeder, we are already not a good fit. If you submit an incomplete form we will not respond. Thank you! Thank you for your time. 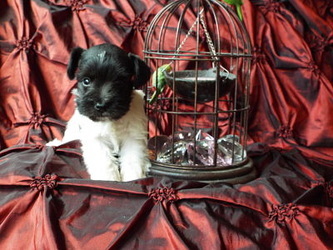 You will be contacted at the phone or email you gave to help you find the right puppy for you. We will not respond to incomplete forms.